It’s perhaps the only bag of airmail ever delivered to the St. George’s Post Office that arrived there by way of the Old Town’s harbour. When the Graf Zeppelin passed directly over St. George’s on its first trial transatlantic crossing from Germany to New York in October 1928, the 776-foot dirigible left more than just an indelible, lifelong impression on the Bermudians who witnessed its low-altitude passage over the island. While over Bermuda, the airship dropped a packet of postcards—intended for delivery to the St. George’s Post Office but feared lost. They were elegant luxury liners crossing oceans of sky. The giant airships built by Germany’s Zeppelin plant in the inter-war years (1919-1938) to ferry passengers, cargo and mail across the Atlantic fired the imagination of the world and inaugurated some of the first commercial aviation routes between Europe and South America. Accurately described as both stately and ponderous, the hydrogen-filled airships were the successors to dirigibles used by Germany’s military during World War One (1914-18) for reconnaissance missions and bombing raids. The most successful airship ever constructed, LZ-127 Graf Zeppelin flew more than a million miles on 590 flights and carried more than 34,000 passengers. Graf Zeppelin embarked on the very first commercial passenger flight across the Atlantic on October 11, 1928, arriving at Lakehurst, New Jersey, on October 15, after a flight of 111 hours and 44 minutes. The ship carried 40 crew members under the command of Captain Hugo Eckener and 20 passengers. The crossing almost ended in catastrophe when Graf Zeppelin encountered a strong squall on October 13. During the storm, the lower covering of the airship’s port fin ripped away, threatening further damage that would have rendered the ship uncontrollable. Captain Eckener sent a repair team of four men—including his son, Knut Eckener—to repair the covering in flight. He also sent out a distress call, knowing that he was risking the reputation of both his newly launched ship and perhaps Zeppelin’s ambitious plan for regular transatlantic airship traffic. The distress signal was soon picked up by newspapers around the world which immediately began to draw sensational parallels between the airship’s troubled maiden voyage and the 1912 Titanic disaster. 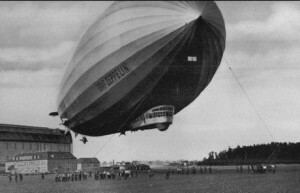 Some reports anticipated the imminent loss of the Graf Zeppelin over the Atlantic while others speculated the airship would make for Bermuda and attempt an emergency landing. But the repair team was successful and the Graf Zeppelin continued on its historic journey only to encounter another storm front as it approached Bermuda. The second squall sent it bucking and bouncing in the severe turbulence and prompted another wave of premature newspaper obituaries for the great airship. But Graf Zeppelin survived the storm relatively unscathed and was spotted about 62 miles off St. David’s on October 14 by the steamer Lafcomo. Three hours later the airship was over Bermuda. “The island was in doubt late tonight whether it had witnessed the passing of the great dirigible Graf Zeppelin,” reported the Associated Press in a wire service story datelined Hamilton, Bermuda. The German dirigible passed overhead in St. George’s and disappeared off the North Shore, apparently on a course for its final destination. It had been cruising around the east and west coasts of Bermuda, probably in search of favourable winds, since the early afternoon. The Royal Gazette was alerted that a package had been dropped from the airship while it was travelling over Bermuda. Mr. Augustinovic has said that a handful of these postcards are known to have survived and are much sought-after collectibles of Bermuda postal history and Zeppelin mail, as well as aerophilately. The Graf Zeppelin arrived safely in New Jersey on October 15, 1928. After a New York ticker tape parade for the crew and other festivities, the airship departed Lakehurst, New Jersey, on October 29, 1928, for its return to Germany. The return flight took 71 hours and 49 minutes, or just under three days; ocean liners of the day took twice as long to carry passengers across the Atlantic.